Amazing nearly new home close to Bailey elementary. Beautiful kitchen, hardwood floors, new theater room and new patio. Bike to Old Dublin! $683,000. Thinking of moving in 2019? Call The Hetherington team to get a jump start on the competition. We’re meeting with sellers right now to get their homes professionally staged and talk about cost effective changes to help them make the most money possible. We start selling a home weeks before it’s put up for sale. While most agents start selling a home when they throw a sign in the yard, we’ve designed a plan to generate maximum exposure, build buyer excitement and help you capture the best possible price. Strategies include sending private notes to other agents, making them aware a desirable home is coming soon. And we work with other agents to get qualified buyers in for a sneak peak before the home is offered for sale. (Buyers love this and often pay more for fear of losing it when it’s offered to the general public). Our marketing is designed to create a rush of buyer interest and maximize seller profits. If 2019 involves a move, call us first! If you’re buying, we know of many homes not yet on the market and can help you find the perfect match. SEE THE BESTOn DUBLIN Search Homes The GoHOMES AT The best Dublin homes www.HotOhioHomes.com at your fingertips! Ask us about the new bestofdublinoh KW mobile App. Get connected today. This Muirfield home flew into contract. The sellers spent $ in all the right updates. Interested in moving? Let us guide you on cost effective updates to make the most money possible. $509,000. This home near Karrer Middle school had multiple offers. We generated $11,000 over list price for the seller. If you’re selling, call us today! 7 buyers were fighting for this home near Bailey Elementary. Our experience with multiple offers helped the seller get $14,000 more. It pays to use a pro. Call Team Hetherington! 1 gaz i ne, es t.
28	And the Grammy Goes To... 2019 Music Educator of the Year Award 30 Student Spotlight Up, Up and Away! Want your snapshots to appear in print? Send photos to ncollins@ cityscenemediagroup.com. LIGHT OHIO BLUE Every second of every day, the brave men and women of the Dublin Police Department put their lives on the line to protect our community. Iâ&#x20AC;&#x2122;m sure I join all Dublin residents when I say how thankful I am for the professionalism, integrity, respect and commitment our police continuously demonstrate. From May 8-16, the City of Dublin will once again be taking part in the Light Ohio Blue campaign. This campaign is a way to show support to the law enforcement personnel who protect our communities across the state and a way to honor and pay respects to the law enforcement officers who have died in the line of duty. Our staff once again have plans to light several City buildings blue this year. Those buildings include the Justice Center, City Hall, the Recreation Center pond and the 5555 Perimeter Drive Building, which will be the future City Hall. Additionally, blue lights are added to the Emerald Parkway and Avery-Muirfield bridges over US 33/SR 161. Back Row: Michael Keenan (At-Large), Cathy De Rosa (Ward 4), Christina A. Alutto (At-Large), Jane Fox (Ward 2), John Reiner (Ward 3). Front Row: Mayor Greg Peterson (Ward 1), Vice Mayor Chris Amorose Groomes (At-Large). Good things happen when you combine For life your home and auto insurance, insurance with State call a good Farm.® Like saving an neighbor. average of $894* Plus, you’ll have a good neighbor like me Call me and I’ll help you choose the right life insurance to help life go right. for you and your family. help life go right. CALL ME TODAY. April/May Dublin Arts Council 7125 Riverside Dr. www.dublinarts.org THROUGH JUNE 7 Opening Doors: Calling Central Ohio Home Tuesday, 10 a.m.-7 p.m.; Wednesday through Friday, 10 a.m.-5 p.m.; Saturday, 11 a.m.-2 p.m. MAY 3 Dublin Arts Council’s Garden Party Fundraiser 6:30-9:30 p.m. The Conference Center at OCLC 6600 Kilgour Pl. We sell more Dublin homes than any other realtor! APRIL 27 Party for the Planet: An Earth Day Celebration 10 a.m.-5 p.m.
MAY 11 Wine for Wildlife 6-10 p.m. MAY 12 Mother’s Day at the Zoo 9 a.m.-5 p.m. MAY 16 St. Jude Discover the Dream 6 p.m. MAY 18 Kids Ele-FUN-Run 7:30 a.m. MAY 18 Zoo ‘Run Run’ 5K 8 a.m. MAY 18 Zoombezi Bay Season Opening Day 10:30 a.m.-7 p.m.
614-726-9070 Each office is independently owned and operated. When it comes to your to-do list, put your future ﬁrst. To ﬁnd out how to get your ﬁnancial goals on track, contact your Edward Jones ﬁnancial advisor today. Taking care of eyes in Dublin for over 30 years! • Licensed opticians / technicians with over 100 years of combined experience. • From the first phone call to the fitting of your glasses or contact lenses, it is our promise to provide the gold standard of eye care from start to finish. • We can help get your records transferred to our office easily. we’re doing enough that they tell other people to join.” So what makes the league so successful? 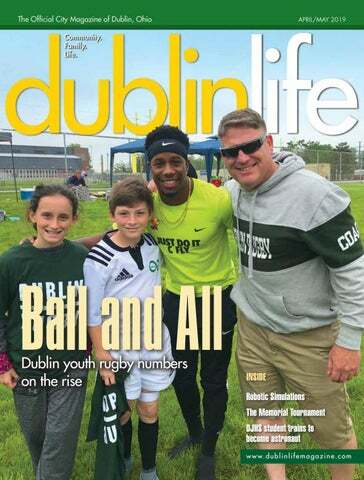 “There’s a level of confidence and camaraderie that comes with any sport, these kids get to go through life with the identity of a tough rugby player,” Northup says. “That’s been our philosophy from the beginning: Confidence extends into how kids handle things in their life and it’s very powerful and makes a big difference in how kids view themselves.” Despite the aggressive nature of the sport, Northup and fellow coaches in the league make sure practices and training drills are structured. “Having a kid get injured is literally my worst nightmare,” Northup says. “My kids play rugby, too, so I’m also scared with having my kids out there.” To mitigate the risk of injury, most of the rugby season is spent playing two-hand-touch or flag versions of the game, without..full-contact tackling. During practices, the players will drill a special type of rugby tackling, which helps protect the head and prevent any serious injury. Only when kids have mastered the safer version of tackling are they allowed to play full-contact. “We only give one award in this league and that’s an award for sportsmanship,” Northup says. “To me, that means putting your team and the other team’s safety above everything else in the game – not mowing over other kids and injuring them to score a point.” The league also has co-ed teams and coaches, cheap registration fees to make the sport available for all families, and different levels of play for all levels of athleticism. Since starting the team, Northup, his fellow coaches and the players have tried to expand the league to as many different people as possible. Most recently, they’re working on forming a team for people with physical disabilities who want to try rugby. “At dinner, my own kids pointed out that we didn’t have anything for players with physical disabilities and I was like, ‘Oh my God, you’re right,’” Northup says. So, beginning in mid- to late-July this year, the Dublin Youth Rugby is starting a wheelchair rugby team. “Even though I got the ball rolling, there is no way that the league would have become anything like what it is without everyone else that’s been involved,” Northup says. “There’s so many things that would not have happened.” Emily Real is a contributing writer. 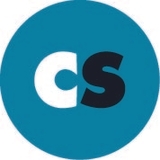 Feedback welcome at feedback@cityscenemediagroup.com. The constant since 1994: REMODELING IS FUN! From left, Josh Sarver, vice president of COSI; Stephen White, vice president of COSI; Dom Tiberi, COSI STEM Star Award recipient; Greg Peterson, City of Dublin Mayor. point A to point B safely. Drive the car like everyone around you isn’t paying attention, because they’re not,” Tiberi says. The Foundation has funded 44 distracted driving simulators, donating most of them to law enforcement agencies around the state, including two to the Dublin Police Department. The simulators provide an interactive, lifelike experience that demonstrates how difficult it is to drive safely while texting and dealing with other distractions. “Through this technology, it’s pretty amazing, kids can see what happens when you drive distracted,” Tiberi explains. “And they’re getting this experience in a safe environment.” The next step – simulator schools. The Foundation is fundraising to open schools that will feature simulators in a classroom setting. Tiberi says he hopes to start with two schools, one in Dublin and one near The Ohio State University, and then potentially expand. STEM Stars from around central Ohio who will represent their communities. It is an honor he didn’t expect for a cause he didn’t choose, but Tiberi says the recognition means a lot to him. “COSI’s always been a special place to my family. It was one of Maria’s favorite places to go,” Tiberi says. Now, with Maria gone, Tiberi does what he can to keep her memory alive and to prevent other families from experiencing the pain of losing a loved one to distracted driving. “There’s nothing we can do to bring Maria back,” he says. “Believe me I’ve tried, and I’ve thought a million times about what I can do to fix this, but there are no second chances. There are no doovers in death, and we just don’t want anyone else to have to go through this.” Learn more about the Maria Tiberi Foundation at mariatiberifoundation.org. Since his daughter Maria’s death in 2013, Dom Tiberi has delivered more than 100 “Maria’s Message” presentations at schools across central Ohio, educating nearly 100,000 students about the dangers of distracted driving. As Dean Dr. William Burke walks along the campus of the Ohio University Heritage College of Osteopathic Medicine, he greets each passing student by name. The City of Dublin was accommodating when the school was built, giving the campus extra space for future expansion. The school’s buildings are surrounded by uniform bricked pathways, wide green spaces and a fish-filled pond. Get daily updates at cityscenecolumbus.com Prizes, ticket packages, deal alerts & more! Above: An example of a room designed to look exactly like a real surgical space. Right: Classrooms are equipped with TVs and swiveling cameras. ONE story at a time. “Loading old fence into my truck, I shattered my shoulder socket and suffered a hill sacs fracture. I knew I had to get back to taking care of the children, taking care of our land and getting back to my career in law enforcement. I had 100 percent faith that Orthopedic ONE would take care of me. It may sound crazy but I’m actually thankful this happened. My life has not only returned, but my quality of life is better. “ - Michael Myers, husband, father and Deputy Sheriff Visit orthopedicONE.com for all of Michael’s story. Tour schedule have created openings in the schedules of some of the world’s top golfers, and that opportunity can only benefit the tournament and its patrons. “We expect that field to be as strong as it’s ever been,” Sullivan says. Our proprietary Balanced Learning® curriculum emphasizes creative, social, emotional, physical, cognitive and character development. 6415 Post Rd | Dublin, OH 43016 614.408.3732 | PrimroseDublin.com Each Primrose school is a privately owned and operated franchise. Primrose Schools® and The Leader in Early Education and CareSM are registered trademarks and service marks of Primrose School Franchising Company. ©2015 Primrose School Franchising Company. All rights reserved. See primroseschools.com for additional information about our schools, curriculum, and programs. Jack and Barbara Nicklaus present the Nicklaus Youth Spirit Award to Maddison Webb at the 2018 Legends Luncheon. #DubLifeMag Want your snapshots to appear in print? Tag your photos #DubLifeMag on Twitter and Instagram, and then send your high-resolution shots to Managing Editor Nathan Collins at ncollins@cityscenemediagroup.com. Include your name and caption information. INSIDE Be Safe on the Scioto Dublin Methodist Hospital 10th Anniversary The Italians Are Coming! tronaut John Glenn. She told him all about her dream of becoming an astronaut. “He told me that I needed to study hard and work hard to achieve my dream – but that it was possible,” Roberts says. “That made me start thinking about what I needed to do to get there. So, at a pretty young age, I began looking at NASA’s astronaut requirements.” Over the next few years, Roberts, now a junior at Dublin Jerome High School, searched for any opportunity to get involved in space exploration. When she was just 11 years old, she went to U.S. Space Camp for the first time. Space Camp – located in Huntsville, Alabama – is a week-long educational program that promotes science, technology, engineering and math. It trains students with hands-on activities and missions based on teamwork, leadership and problem solving. Space Camp is specifically designed for trainees who have a particular interest in space exploration. Participants visit from all 50 states and more than 120 countries around the world. When Roberts attended Space Camp, her desire to be an astronaut only grew. Roberts has been to Space Camp every year for the past seven years and is preparing to go again. “This summer, I’ll return to Huntsville for my eighth summer at Space Camp. Hearing first hand the experience of current and former astronauts is a highlight of Space Camp for Roberts. Hilda’s art is making music and creating songs that touch and entertain people. She comes from a musical family, and takes joy in performing with her daughters, watching them grow professionally and express their creativity. Like Columbus, music changes and enriches her life every day, and there is no place she’d rather make it. Additional support from: The Sol Morton and Dorothy Isaac, Rebecca J. Wickersham and Lewis K. Osborne funds at The Columbus Foundation. Marty Parker’s infectious personality joins the Dublin community FOR THE LAST FEW YEARS, you’ve read about the people who grew up in Dublin before it was a city, when riding a horse in to town was more efficient than driving a car. In 2019, you’ll be reading about some newcomers and seeing Dublin through their fresh eyes. scheduled it, made fliers and had complete strangers driving from out of town only to be turned away because it was a private event.” Parker’s father owned a number of bars outside of Dayton and approached the family’s annual event the same way he promoted his bars. “Growing up in that environment, organically, I was exposed to how you’re supposed to throw an event,” Parker says. “Instead of having that as a wasted area hidden behind the large structure, our homeowner wanted to incorporate an herb garden and (Peabody) added that gate as a little feature, which is really nice,” Nicholson says. 614-361-8853 We love working personally with both Buyers and Sellers! The Patio Outdoor kitchens are always a popular touch. But Nicholson wanted to make sure the new area looked preexisting and complementary to the fireplace patio. The plaza features a blue stone, which is carried over from the original patio, outlined with bricks that match the new kitchen and original chimney structure. Nicholson also built the pergola, using cedar timbers with a natural finish and cast stone pillars to give an aged look. The homeowners then planted a vine so the structure will eventually feature a natural canopy. The Secret Garden What’s an oasis without a secret garden? In order to fill the small space between the fireplace and arborvitae trees, the homeowners decided to create a small herb garden. The area features a garden bed and a scalloped arbor gate – adding the final touch to this magical new back yard. “It’s always fun when you’re partnering with a homeowner who wants to invest in quality detail or architectural details,” Nicholson says. “It was a beautiful project with wonderful clients and homeowners.” Lydia Freudenberg is the brand loyalty specialist. Feedback welcome at lfreudenberg@cityscenemediagroup.com. “One night, while walking up our driveway with the gas lights burning and the view of the pergola, I looked at my husband and said, ‘We have our own little piece of heaven here,’” Balturshot says. what’s your style? Your Dublin Experts! We sell more Dublin homes than any other realtor. and to meet friends at all hours of the day and night. We tend to worry more when the kids are under our roof than when they are away, so it isn’t too much to ask for a check-in text and access to their location on the Find My Friends app. that I have missed while away at school. Don’t get upset with your kids for making those arrangements, but sit down and discuss a plan for fitting in time with everyone. Trust your college kids and acknowledge that your relationship has changed since they left. Most people think the hard part about going to college is leaving the nest and not having anyone guide you toward what you should and shouldn’t do. However, it can be more difficult returning home and being told what to do constantly. We understand that you just want to protect us from the world, but as we grow and change as adults, our parent/child relationship grows and changes as well. Try to parent less, take on the friend role when appropriate and be aware that we can make our own decisions. Acknowledging and listening to your child’s accomplishments and personal college experience can be really meaningful. Colleen D’Angelo is a freelance writer who lives in Dublin with her husband, three children and several small animals. She enjoys playing tennis, walking the Dublin bike paths and traveling. Parkland: Birth of a Movement by David Cullen In the face of horror and tragedy, the survivors of the shooting at Marjory Stoneman Douglas High School used their grief as a catalyst for change. Rather than by diving into the mind of the shooter, David Cullen, author of Columbine, reports through the voices of key participants of the Never Again MSD movement. Harrowing and beautifully told, Parkland explores how a group of students rallied in the face of unspeakable violence in order to drive national change. Dublin Life Book Club Selection Editor’s note: To be added to the Dublin Life Book Club mailing list and for more information, email Managing Editor Nathan Collins at ncollins@cityscenemediagroup.com. a home thatâ&#x20AC;&#x2122;s uniquely Located in Dublin City School District, Jerome Village offers 16 neighborhoods featuring a diverse range of architectural styles, home sizes and price points to meet your needs. At OhioHealth, we believe health is more than just numbers on a chart. It’s about doctors and caregivers who meet you where you are on your journey. That’s why we offer a full range of care, including wellness programs designed to keep you healthy, urgent and emergency care facilities when you need immediate attention and compassionate primary care physicians who believe your best health is always within reach. Find your partner in health at OhioHealth.com/FindADoctor. © OhioHealth Inc. 2018. All rights reserved. FY19-Brand-PTBH. 01/19.